Eight-hour Merino ewe record holder Cartwright Terry, left, with NSW shearer Josh Clayton, after his attempt to set a new mark. Photo – Lou Brown. NEW South Wales shearer Josh Clayton failed in his first attempt on the eight-hour Merino ewe record on the weekend, but put up a world-class effort under trying conditions. The 34-year-old managed run tallies of 114, 115, 115 and 108 in the rising three year-old Merino ewes on Saturday, to fall 14 sheep short of Kiwi Cartwright Terry’s record tally of 466 ewes. 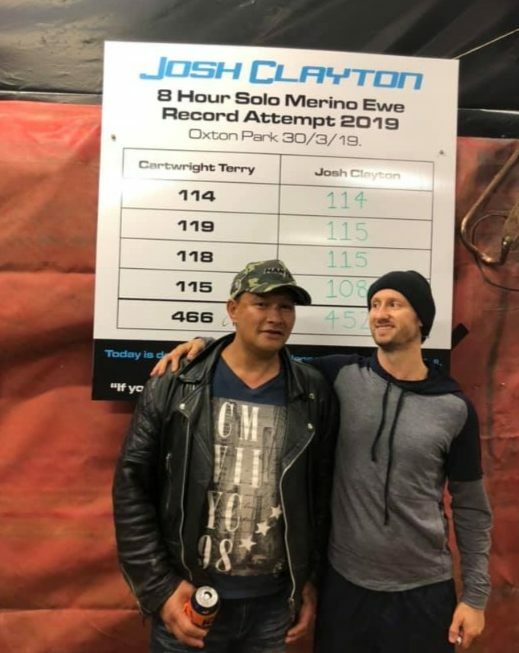 The New Zealander’s record was set as part of a two-stand record of 924 made with brother Michael James Terry at Westindale, south of Perth, Western Australia, in February 2003. Co-judge Peter Artridge said crowd support for Clayton’s attempt was unbelievable. “They were singing along to the songs on the jukebox in the last run, cheering and yelling and screaming until he pulled his last one. More than 200 supporters watched Clayton’s attempt on Saturday in the Oxton Park shed at Harden, NSW. Mr Artridge said Clayton was unlucky with the weather leading up to the attempt and the weight of wool on the sheep. The amount of dust in the fleeces made it hard to get a good cut and they weren’t combing the best. “The sheep had to be locked up during the week, which hollowed them out and tightened them up a little bit. “If the sun had come out at lunchtime it could have been quite a different result,” he said. “It was just absolutely freezing there and at one stage the hail was blowing in under the ridge cap on the shearing shed and bouncing off his back while his shearing. “But he was making jokes about it and he stayed cheerful and happy the whole day,” Mr Artridge said. Warmer conditions are preferred for record attempts to facilitate good combing. The sheep shorn also averaged 4.6kg fleeces, whereas only a 3.4kg was required under World Sheep Shearing Records Society rules. Cootamundra contractor Tristan Phillips said it would have been good to have the sheep at around 24 degrees Celsius. “Pound for pound I don’t think anyone in the world would ever match that, what he did there on Saturday. Josh Clayton said the hail and the rain in the board made it slippery as a storm hit during the attempt. Clayton said he proud of his phenomenal 452 ewe effort, which would be a good tally on any day under the conditions. He said he only needed to shear every sheep an average of two seconds faster to have beaten Terry’s record. “That’s all it was, I’m pretty sure two seconds a sheep all day is 16 sheep at the end of the day. “But the gear just hummed all day the Heiniger gear was just unbelievable,” he said. He gave special thanks to his ‘number two’ and manager of the record – Heiniger representative Rocky Wegner, his gear man Klynt Corell, and Brock Koch, who was in charge of hydration. The shearer has not ruled out attempting the record again at a later date. Clayton said he had not ruled out attempting the record again at a later date. On 27 April, Western Australian shearer Louis Brown will also try to set a new eight-hour Merino ewe record at Rockliffe Grazing, Samson Road, Kojonup, Western Australia. Brown is originally from Gisborne in Victoria, but is now based at Bunbury, south of Perth. Brown flew from Western Australia to support Clayton’s attempt.